We offer several styles of bikes for hire including hybrid, mountain, tandem and E bikes. There is also a variety of equipment available including baby/child trailer, child read mounted seat, childs tagalong bike and more. For more information on our cycles head over to the Cycle Hire page. By pre arrangement we can provide pick up and drop off services to Christchurch or Queenstown airports at $600 or Dunedin airport at $400 for up to eleven passengers. 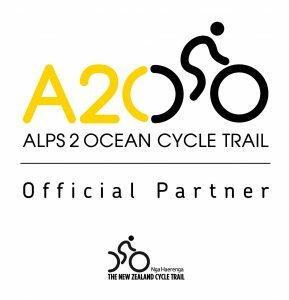 When planning your A2O adventure contact us to see if we can assist with transport of your luggage between your accommodation location for a cost of $20 per bag (minimum bag numbers may apply). Car storage, vehicle transfers and, equipment sales and A2O merchandise are available for purchase.